In addition to our Perfection signature range, we also stock a selection of Sincerity Bridal Dresses. ot one, not two, but three keyholes will leave all eyes on you in this fit and flare gown with a charming Queen Anne neckline and illusion long sleeves with tattoo lace. Every princess loves lace. This illusion Sabrina neckline is accented with Venice lace which then covers the bodice and Illusion back of this crepe wedding dress. Finished with a scalloped train with illusion lace. 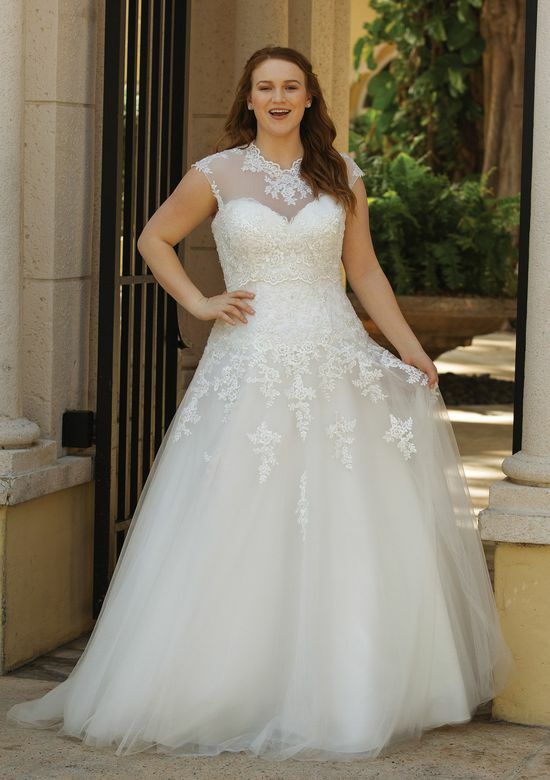 Chantilly lace feels extra romantic in this off the shoulder fit and flare wedding dress accented with hand beaded lace. 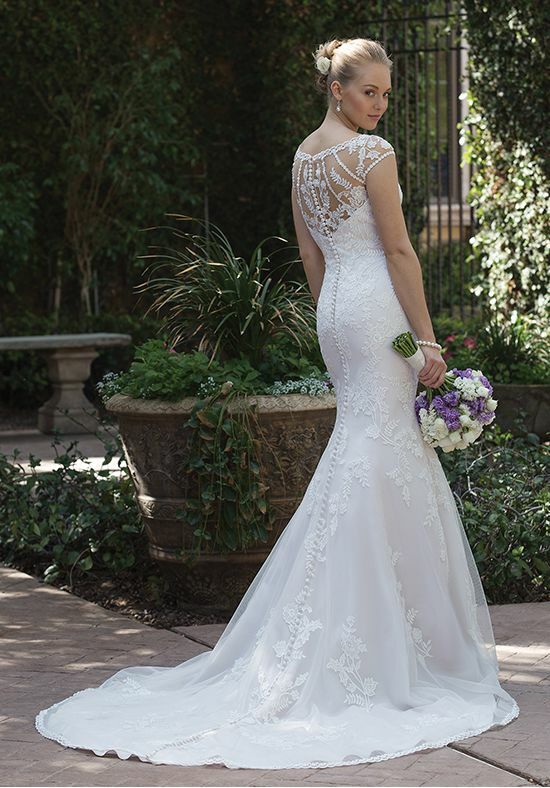 The soft feeling of Chantilly is felt in the illusion back adorned with embroidered lace and finished buttons. Feel graceful and light in this Jersey and tulle wedding dress. Hand beading accents the sweetheart bodice of the gown paired with a light tulle skirt for effortless movement. Spaghetti straps crisscross the back of the gown to the beaded Illusion square cut back. 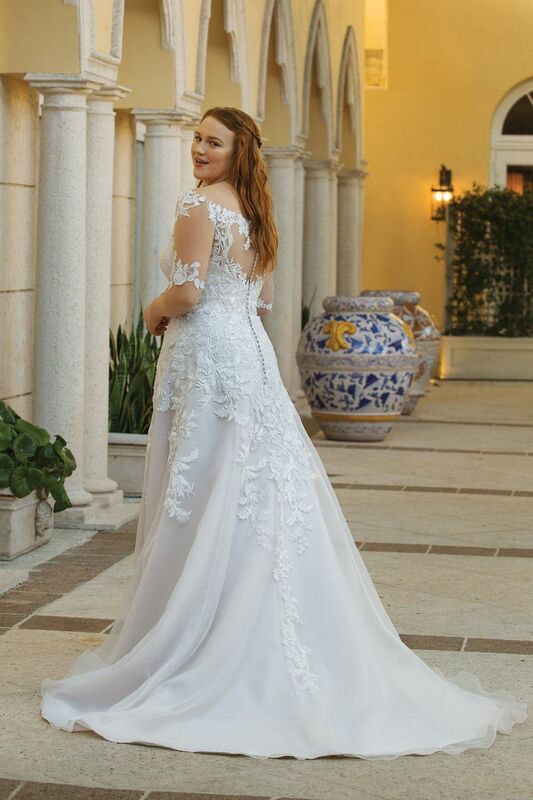 Comfort is key in this traditional Chiffon wedding dress. An illusion off the shoulder neckline is framed with embroidered lace. A scoop Illusion back with button closures completes the romance. This sweetheart gown is lined with Charmeuse for extra comfort. Corded lace covers the bodice and floats down the tulle full skirt. Designed for impeccable shape, this fit and flare will leave your guests wowed. Romance is defined in this tulle ball gown. The gown is lined in Charmeuse to feel as good as you look. A pleated tulle bodice is accented with a thin hand beaded belt. 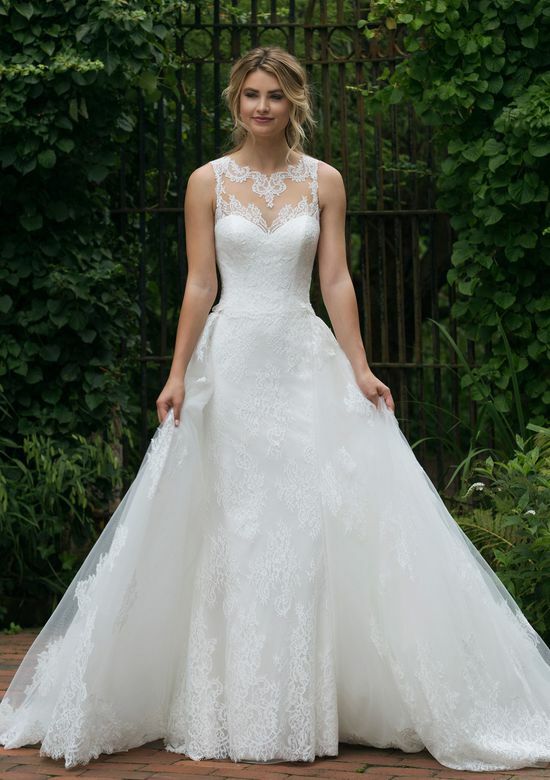 Soft lace accents float down the skirt of the gown to the finished hem lace. It’s fun being a girl in this corded lace Sabrina neckline wedding dress with a full mikado skirt and pockets. 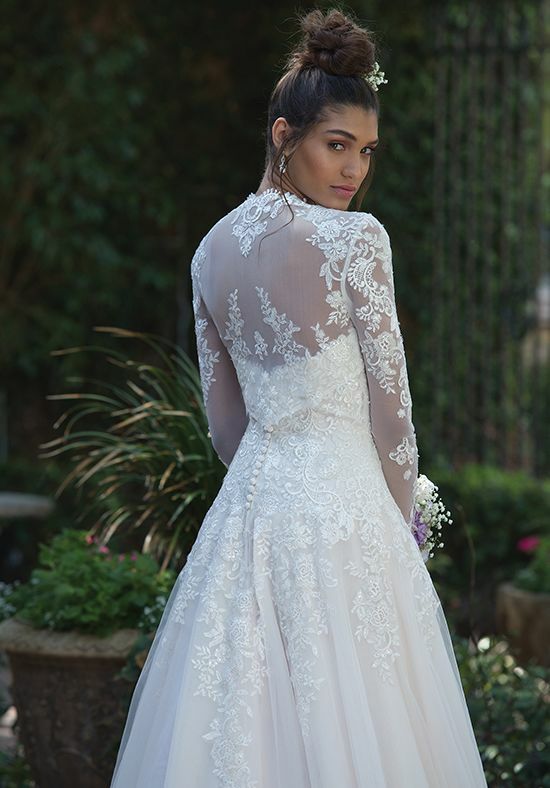 Illusion corded lace covers the square cut back. Walk down the aisle in this allover lace gown with a fit and flare silhouette. The illusion Sabrina neckline continues to the illusion back with covered buttons and loops for the closure. 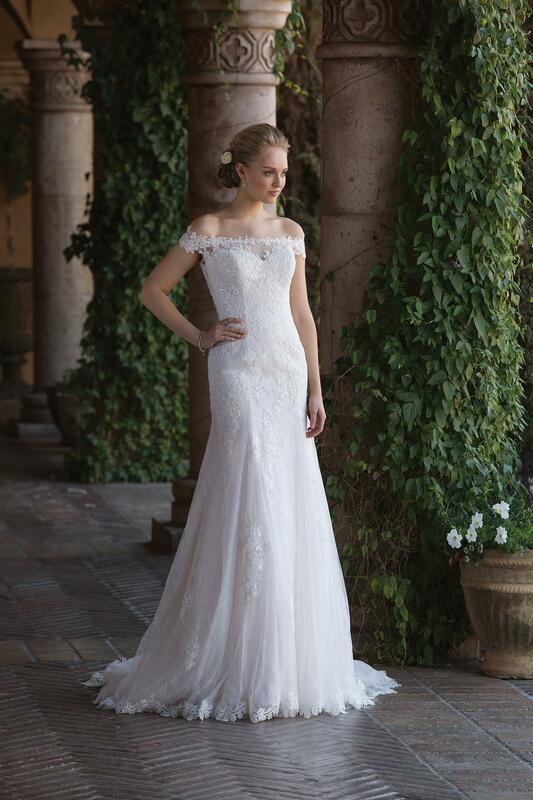 For added romance, the detachable chapel length train attaches at the dropped waistline. Feel dreamy in this ultra feminine strapless A-line gown. Embroidered appliques lie atop the asymmetrical lace bodice. This romantic style is completed with a corset back and a clean tulle skirt. Turn heads in this flattering satin bridal gown. This mermaid silhouette will accentuate your figure with a tulle skirt finished with horsehair at the hem of each tier. The matching finger tip length veil finishes this perfect wedding day look. 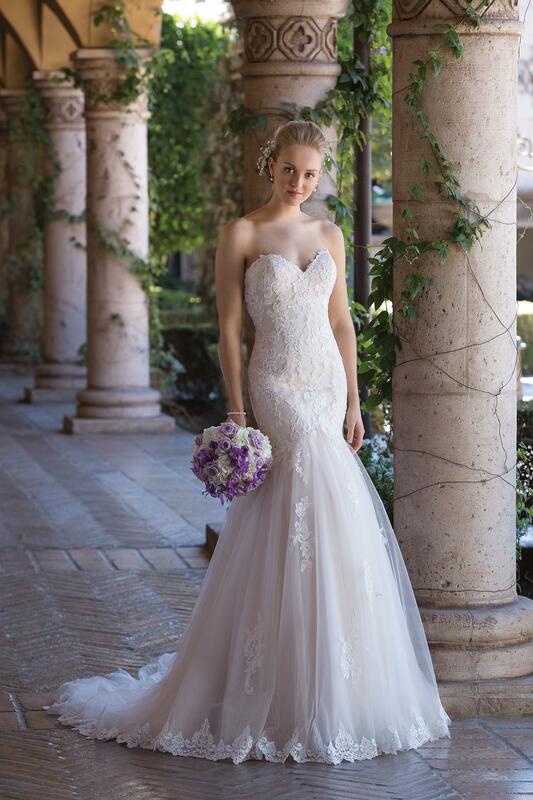 Feel dreamy on your special day in this sweetheart lace A-line wedding gown. Embroidered lace adorns the bodice with a lace scallop along the sweetheart neckline and cascades into the flowing tulle skirt. Add on the popover jacket to complete this romantic look. our magical day begins in this off the shoulder fit and flare gown. Delicate lace appliques cover the bodice and adorn the neckline to the shoulders. Stretch Jersey lines the dress for effortless movement all day long. Feel dreamy in this ultra feminine tulle ball gown. Pleated details wrap the bodice as the beaded illusion back adds a stunning element of surprise. The full tulle skirt will leave you gracefully dancing the night away. This on trend mikado ball gown is everything and more. It has an asymmetric draped V-neckline that leads to a natural waistline and pockets. Buttons to the end of the chapel length train complete the look. Charm the crowd in this A-line gown that features a V-neckline with spaghetti straps and beaded lace appliques. The tulle skirt is decorated with beaded appliques throughout, a horsehair hem and buttons at the zipper closure. You can view more images of these dresses on the Sincerity website.